Wildcat Falls is located in Pisgah National Forest in North Carolina. The falls are a short hike from Highway 215 and close to The Blue Ridge Parkway. Wildcat falls is 50-60 feet high, easy to get to, family friendly and has a unique old concrete logging bridge that runs over top of it. Definitely a unique and beautiful waterfall. Directions: From The Blue Ridge Parkway, take NC Highway 215 exit and go north on 215 (you’ll turn left). Go .8 miles, and turn right into a gravel drive marked with a small sign that says BR1. Watch closely for it, as it will sneak up on you. You’ll see a parking area large enough for 3-4 cars. If the lot is full, you can continue north on 215 for another quarter of a mile, and a there will be additional parking on the left. Wildcat Falls is a 50-60 foot waterfall located 3/4 of a mile down Flat Laurel Creek Trail. The falls are on a small tributary of the west fork of the Pigeon River, and as result, it isn’t a strong flowing waterfall. Wildcat Falls is best viewed after a strong rain. We first visited the falls in October of 2014, and the flow was very strong. Once you park in the lot, you’ll access Flat Laurel Creek Trail by walking to the back of campsite area. There are 3 or 4 different campsites here, just walk to the one furthest back from the road. You’ll see the old logging trail and railroad grade heading down to Bubbling Spring Branch. You’ll need to rock hop Bubbling Spring Branch or use the log the park service has placed across the branch. Waterproof hiking boots really come in handy here, especially when the branch is running strong like it was when we visited, but even without them, carefully picking where you put your feet will keep them try. If you decide to use the log, make sure it isn’t iced up – I learned this lesson first hand and just about ended up going for a swim! The majority of the trail is relatively flat, with only a slight incline as you walk up the falls. You’ll often find yourself surrounded by Rhododendron trees. The trail is well maintained, but a bit rocky in a few places, so watch your step to avoid twisting an ankle. The trail was once an old logging railroad grade and logging road. While the trail is now much more narrow, if you look closely, you can see where it was once a much wider road grade. You’ll also note the base of the trail is old railroad ballast. 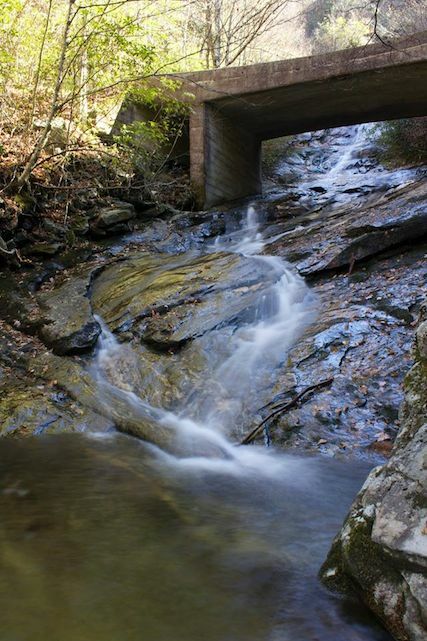 At the quarter mile mark, you’ll pass two small waterfalls, and another small “rock hop” across a small creek. This is not Wildcat Falls, so keep going. We stopped for a few minutes to take some photos of the twin falls. As you walk the rest of the trail, note the dense pine forest to your right. Take a few minutes to walk up in it and enjoy the spooky yet beautiful forest. Our kids had a blast running around under the trees and climbing on the rocks. As you hike down the trail, just about the time you begin to wonder if you missed it, you’ll hear the sounds of the waterfall in the distance. Then all of the sudden, you’ll walk around a curve and see a very much out of place concrete bridge that crosses over Wildcat Falls. The bridge makes for a great picnic location or just a wonderful spot to lay down on the cool concrete, close your eyes and enjoy the sounds of the falls and woods around you. On the lower side of the bridge, and nearly under it is a smaller falls. There are multiple ways to get there, but the safest is to cross over the bridge, and about 20 feet past it is a fairly steep “path” leading down to the rocks below the falls. Just be careful, and grab a few branches to keep you steady. If you’re hesitant to go down, than it’s probably best to just stay up top. You’ll note the trail continues past the bridge. This is Flat Laurel Creek Trail, which loops up to Black Balsam and back down to the camping area where you started. To return back to the parking lot from the bridge, just follow the trail back. You’ll note that along the trail there are a number of really nice creekside campsites. We plan to give these a try next summer.